A classic holiday cocktail, this Homemade Eggnog Cocktail is thick, rich and flavorful – everything a good eggnog should be! Before this year, I had never had real eggnog. You know, the from-scratch, homemade, authentic kind – not the kind that you get in a carton. I liked store-bought eggnog – I’ve even incorporated it into several of my favorite recipes, like my Fluffy Eggnog Cake with Eggnog Buttercream or my 10-minute Eggnog Pancakes – but homemade eggnog is in a category all by itself. It’s almost like sipping on a old fashioned egg cream, or a custard milkshake with a good dose of holiday spice. And when you incorporate some good quality rum into the mix? You’ve got one delicious cocktail, perfect for sipping with friends or while curled up in front of a fireplace with cozy socks and a blanket draped over your lap. If you’ve never had homemade eggnog, you need to move some things around and free up some time on your calendar tonight – because this one is a must-make! 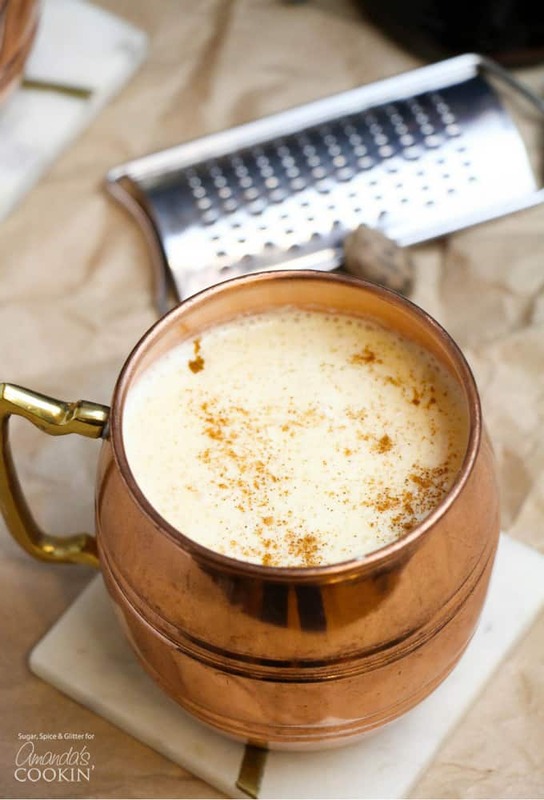 And just a note for those who may be squeamish about raw eggs – this is a cooked eggnog. The yolks and cream are cooked through, but the whites are incorporated while fluffy and cold. You could potentially leave out the whites but the texture will be thicker and the taste will be less balanced with a stronger egg taste. Using pasteurized eggs and ensuring that the egg whites don’t come into contact with the outer shell are your best bets to prevent any issues with the raw egg whites. Egg substitute will not work for this recipe. 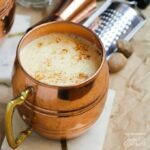 Have you ever had an eggnog cocktail? 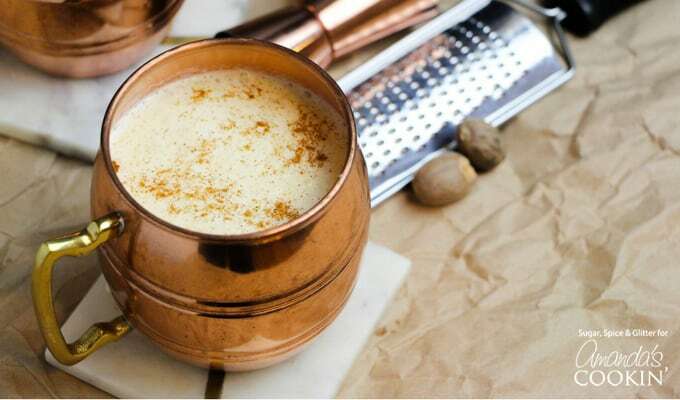 This homemade eggnog cocktail is unparalleled and reigns supreme over all other holiday cocktails. Serve up some of these delicious sweet potato oat cookies to accompany this eggnog drink or even this infamous Saltine Toffee. Both of which are perfect additions to your holiday gatherings! 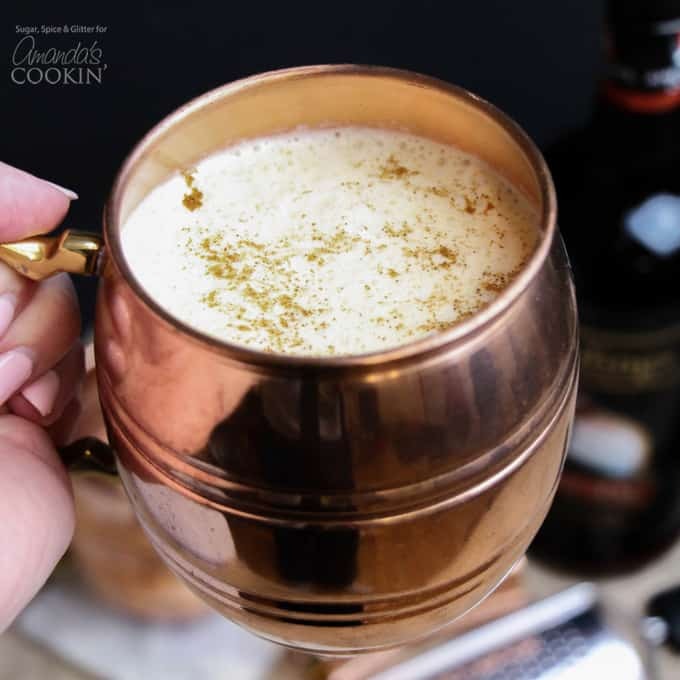 Toast the holiday season with this homemade eggnog cocktail! A great way to usher in the holidays. Add the 1/3 cup of sugar to the beaten yolks and beat for 3 minutes. Once cream comes to a boil remove it from heat. Slowly drizzle the egg yolk mixture into the hot cream whisking constantly. Adding the eggs slowly and whisking briskly will keep the eggs from scrambling like they would if you added them all at once! This is called "tempering the eggs". Continue slowly drizzling and whisking until completely combined. To ensure even distribution of the rum, I prefer to add 1 oz to each mug and give a decent stir.